Before removing the engine we rigged up an ignition and fuel delivery system in an attempt to assess its condition. In spite of fuel leakage in the "teapot" carburetor the old motor started up and ran quite smoothly, but there was lots of blue smoke. We weren't worried about the smoke because we'd be replacing all of the components that might be the cause. We then took it apart for a rebuild. 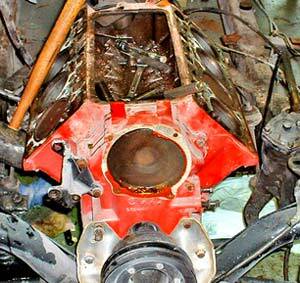 The engine's bottom end was very intact and had obviously been recently rebuilt (by "recently" we mean that the engine had been worked on in the early 90s, then the car was sold and subsequently stored for restoration). The bearings had been replaced and there was [still not dissolved by oil] assembly lube on the rod ends and main bearing journals. 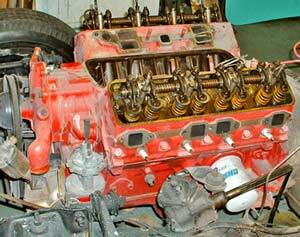 This means the engine was run for a very short time before being sold off to the next owners. Note the excellent condition of the journals. We removed the pistons and rods and discovered two problems. One piston had a hole in the top that penetrated 2/3rds of the depth and another had probably been dropped on the floor, locking in the top ring. 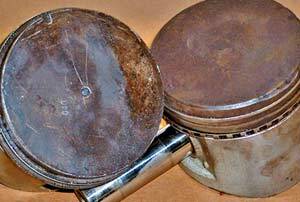 All pistons had been assembled with the ring end grooves in line rather than staggered. The flawed pistons and ring end grooves certainly added to the smoking problem. We decided to replace all the pistons, along with rings, bearings, seals, etc., during the rebuild. We saw that the existing pistons were .040 oversized, and measured the bores to verify that there wasn't too much clearance before ordering new pistons (due to the two damaged pistons). We also put a micrometer on the crankshaft journals to measure the dimensions for the so that we could order the correct-size inserts. 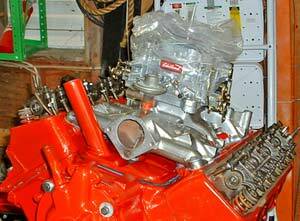 During Parts were ordered right away, as was a new Edelbrock carburetor, Pertronix electronic ignition and matching coil. Here's the reason for the smoking. The heads were in pretty good condition overall, but we decided to re-seat each of the valves by using compound and the old "spin by hand" technique. First, however, all components had to be cleaned and prepared for paint. We removed the grease and oil from the block and heads using solvent. Then we hooked up the pressure washer and blasted out the cooling passages. The pressure washer also did a fair job of removing loose paint and rust on the exterior surfaces. We flushed out the water jacket with our pressure washer. When honing the cylinders, try to maintain a good cross-hatch pattern. Once the block and heads were cleaned we applied stripper to take off any residual paint, then wiped down the surfaces with phosphoric acid (metal prep.) The acid dried overnight and we sprayed a coat of self-etching primer to prevent flash-rust and get the pieces ready for painting. 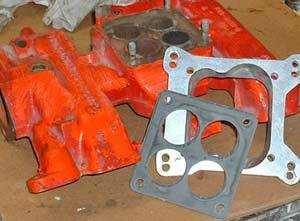 We also cleaned and prepared the timing chain cover, intake manifold, water pump and oil gallery cover. By the time we'd cleaned the assemblies the new parts were delivered. Starting with the block, we proceeded to put the engine together. 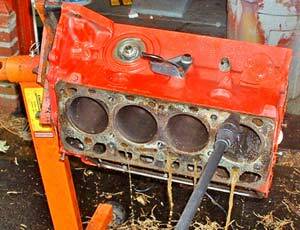 The first thing, of course, was to thoroughly clean out the cylinders and hone them for the new pistons and rings. After honing we wiped the surfaces clean with several applications of solvent to get rid of any leftover grit. 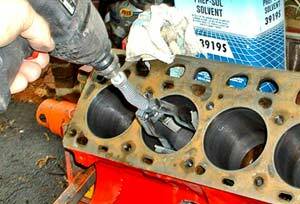 We cleaned the main bearing journals, rod and crank journals and oil galleries the same way. 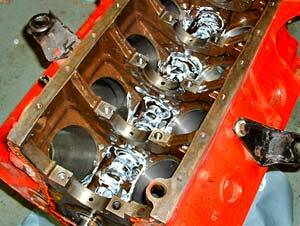 We double-checked the new ring end gap and then sprayed the cylinder walls with fogging oil. 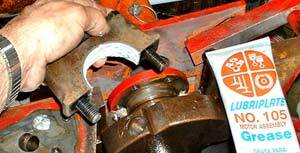 We inserted the rings into the cylinder to check the ring gap. 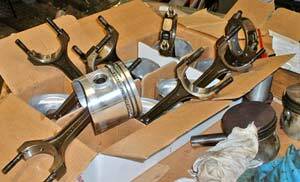 We assembled the rods onto the new pistons and installed the new rings. After cleaning and inspecting the lifters, camshaft and bearings, we coated the parts with assembly lube and installed them. We did so because access to the parts was far easier without the crank and rods being in the way. Installing the camshaft...note generous application of assembly lube. The crankshaft went in next, after coating each main bearing and journal with assembly lube. We carefully torqued all the main bearing caps a little at a time, making sure the crankshaft turned freely as each cap was tightened. Once the caps and end seals were properly tightened, we carefully measured the crankshaft end play. 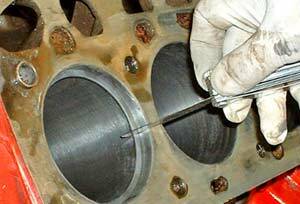 This is a critical dimension, as too little causes leaks and block failure while too much causes main and rod inserts to wear quickly. 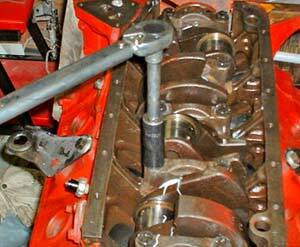 Next we installed each piston/rod into its proper cylinder. 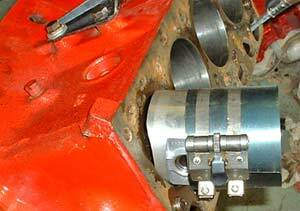 We turned the crankshaft frequently to be certain that nothing was binding. The sleeve holds the rings in place as we slide the piston in. 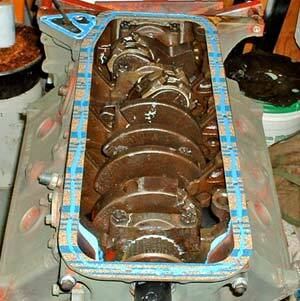 With the pistons, crank, camshaft, etc., in their places, we carefully installed the timing chain and sprockets. The Y-Block has a somewhat strange procedure for installing the chain, so we consulted several sources and double-checked the location of the timing marks while counting the number of links of chain between the marks (12). 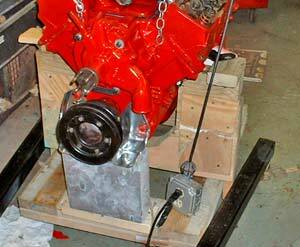 After assuring ourselves everything was correct we installed the cover and its crankshaft seal, then turned our attention to the heads. 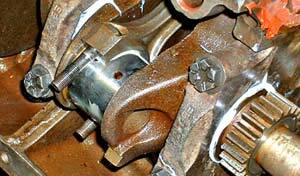 We brought the connecting rods to rest on the crankshaft, being careful that we didn't mar the crank surface. 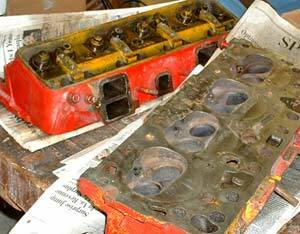 The heads were in good condition, so after removing the valves and springs we degreased and pressure-washed the castings. This work was followed by a coat of etching primer (rust, you know) and an inspection of the valve guides and seats, as well as the valves themselves. All that was needed, we concluded, was a re-grind of the seats. We re-ground the seats the old-fashioned way, with grinding compound and a suction cup on a stick. This will be covered in a future how-to article, so we won't go into detail now other than to mention that the task took about two hours. After cleaning everything thoroughly after the grinding we reinstalled the valves and springs and checked the spring height. 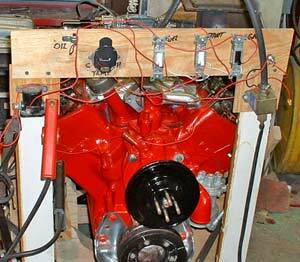 We had decided early on to replace the old "teapot" carburetor with a new, much more high-tech, Edelbrock carburetor. This required a transition piece to match the new carburetor's bore spacing to the old Y-Block intake. Carburetor adapter for our new Edelbrock carb. 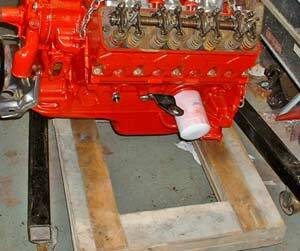 We stripped, sand-blasted and thoroughly cleaned out the intake and primed it for painting, then double-checked the carburetor mounting and fitting of hardware. It was then powder coated with a chrome-like finish. Ready to move our engine to our test stand. We installed the heads (torqued carefully, of course) and the rest of the components while the engine was on the stand. With everything in place we were ready to move it to our rolling test stand/cart for actual running. The base of our test stand is wheeled into place. We will assemble the stand under the engine. We used the engine crane to drop the 650-pound assembly onto our cart, then placed the necessary wood supports underneath. Once the engine was stable and in place we constructed our temporary "dashboard," complete with switches for ignition, start and fuel pump. The test stand is taking shape. Our primary consideration is that the engine is on a stable base for our testing. We were pleased when, after connecting battery and fuel, the engine started on the first crank!